Includes booklet in German, English, and Latin. Quicktime 4 is necessary (multinode scenes are used) but this is provided for installation on the CD. Other technical requirements are not provided. The problem is familiar. At Carnuntum, as at many other Roman sites, only the lower courses of walls of most buildings survive. Apart from a handful of experts, most visitors find it difficult to visualise what the ancient town would have looked like from the crumbling remains, so how can we capture the public's fascination? One way is to build an expensive life-size reconstruction, which has indeed been done very successfully for the temple of Diana at Carnuntum. In 1996 however, when a new company took over the management of the site, they opted for a different way to "offer visitors history that comes alive." 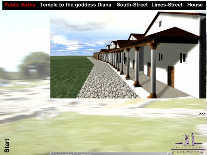 A virtual reconstruction of a small part of the town was thus commissioned. The result, in the form of this CD-Rom, is a promotional product which aims to further public interest in Roman culture and in the town of Carnuntum specifically. This is not meant in a negative sense: the prime purpose of archaeology is to stimulate public interest in the past, and not to confine knowledge to a small circle of experts. Promotion in the sense of creating genuine excitement about our cultural heritage is certainly a most welcome aim, but does the CD succeed in this? I am not an expert in virtual reconstructions. It is for others to judge to what extent any shortcomings of the CD reflect the current state of technological development or to what extent improvements would have been possible. What I am interested in is solely whether this CD keeps the promise of creating a lively and reasonable accurate picture of the past, and not whether it is better or worse than other comparable products. One of the two mayors (duumviri iure dicundo) of Carnuntum invites us to join him on a guided tour through the town. And who could refuse such an offer? Carnuntum, a Roman town in modern Austria, was the capital of the Roman province of Pannonia Superior. The duumvir offers his tour in three different languages: Latin, English 'Lingua Anglica' and German 'Lingua Germanorum'. Those who choose the English or German tour are told that 'the number of soldiers who are supposed to protect us is always being reduced and that the emperors, the Augusti and Caesar<es>, are always busy at other frontiers.' These claims hold only true for certain periods; the reference to more than one Augustus and Caesar implies, to the historically educated tour guest, that it is the time of the Tetrarchy, the rule of four emperors (AD 293-308/ 311). However, it is quite clear from other passages, such as the section on coins and the description of Carnuntum as both municipium (i.e. before AD 194) and colonia (i.e. after AD 194), that the CD is not meant to refer to any particular point in time within the Roman Imperial period. Historians would perhaps be better off listening to the duumvir's complaints about the small number of soldiers in Latin since most chronologically sensitive remarks are omitted in this version. Only a small part of the town is accessible. It is perfectly understandable that as a result of both the limited excavations at the site itself, and finite time and resources available for compiling the CD, only a limited area can be shown. However, the visual reconstruction shows repeatedly that these few houses are located in an empty vast green plain - misleading surely, for we are in fact in the middle of a large town. It should have been possible to avoid such a false impression, especially if the creators of the CD had avoided the fly-over technique when moving from one building to another. Navigation was easy. The buildings can be visited in any order and, within certain limitations, we can navigate our own way through the individual sites visiting the public baths, a private house and a temple of Diana. We can enter selected rooms in the buildings by clicking on the doorways and it is possible to move around within the room. Options are, however, very limited. Some additional information on certain aspects of ancient town life in this CD-Rom will certainly be of some educational use, such as on underfloor heating, or the latrines. The educational value would have increased however if all relevant parts of the selected buildings were accessible, or if we were told what their function was. For example, there is only access to the cold bath room in the public baths, not the warm bath room, the hot bath room or the sweating chamber - the mere thought would have made most real Romans shiver! We are not even informed which room we are in, nor can we find out that the other bath rooms have actually been excavated. Notwithstanding, the reconstructions give us a good idea of architecture, dimensions and interior-design, and this virtual tour is a useful supplement for visitors of the museum and the archaeological remains. However, the supplementary paper brochure claims much more: it claims that the digital reconstruction shows Carnuntum 'full of life' and that it 'breathe[s] virtual life into Carnuntum'. But is this really true? Although representations of real excavated objects, interior decorations and the original fabrics were used in the reconstructions, there are no cracks in the walls, no dirt on the ground, no paint is flaking off; there is no human motion, no life, not even a spider's web. I certainly would not have the artistic talent to accomplish what the compilers of this CD have done, and certainly everybody who has ever produced or given advice on producing a mere two-dimensional reconstruction drawing will appreciate what efforts must have gone into such a digital model. Notwithstanding the artistic efforts, this virtual reconstruction is not yet capable of making us forget the present for a moment, of bringing us back into a past age. When gliding through the streets and flying at high speed over the uninhabited and yet not ruinous ghost town, there remains the impression of having entered a strange, futuristic, high-tech world and not having sampled the atmosphere of a Roman town. Pioneering efforts are welcome and there can be little doubt that in the not too distant future virtual reconstructions of the kind that Carnuntum Virtual Tour strives to be, will be a powerful tool to capture the public's fascination for the past. At present though, anybody wishing to immerse themselves for a moment in the illusion of living in Roman Imperial times would be better off to visit one of the few well-preserved archaeological monuments or a life-size reconstruction, to look at a less sterile and abstract two-dimensional reconstruction drawing (perhaps with human beings), try their hand at experimental archaeology or to watch, despite all imperfections in detail, one of the better Hollywood productions on a Roman theme.